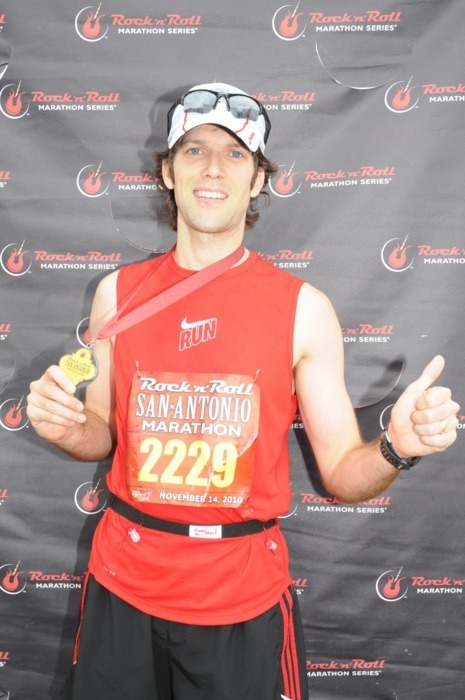 My Run: Overall, the Rock n’ Roll San Antonio Marathon (RnRSA) was my sixth full marathon, and my second in the last six weeks (Twin Cities Marathon on 10/03). At Twin Cities, I was going for a Boston qualifying time of 3:15, but came up short. Even so, I still set a new PR of 3:25. For RnRSA, Boston was no longer a priority since it is already sold out for 2011. Additionally, my expectations were scaled back due to lingering problems with patellar tendinitis in my left knee, and IT band pain in my right hip. Because of this I did not run at all during the 4 days immediately preceding the event, and decided that I would wait until Sunday morning to determine my pace based on how I felt. I knew from the expo that there would not be a pace group for 3:25, but only for 3:20 and 3:30. Based on my injuries, I felt like 3:20 would be very aggressive, and really didn’t want to jeopardize the race just because I like running with pace groups. On the morning of the race, I did a 5 minute warmup run followed by 6 x 100m stride outs. During the warmup, my right hip felt fine, but my left knee was very sore and stiff. I was worried that this would end up being a big problem for the race, but was determined to give it a go regardless. I decided to start out the race at 3:25 pace (7:51 per mile) and see how that felt. I was not wearing a pace band, so my focus was mostly on just making sure that I did not get too fast, and not so much on any specific goal finish time. Even though the race time was posted as 7:00am, it did not start until 7:15am. Not sure why it was delayed, but this messed up the timing of my pre-race gels, and my knee started to get stiff while waiting in the coral. I tried to keep stretching, but it was hard to move around. However, the weather was perfect with overcast skies and temperatures in the low 50s at race start and high 50s at the finish. That’s about all you could hope for in San Antonio. As the race started in downtown San Antonio, I did not feel good at all. My knee was sore, and for some reason my heart rate shot up into the mid 170s during the first two miles. Considering that I was hoping to keep my heart rate in the low 160s during the race, this was somewhat alarming. However, after 2 miles my heart rate settled down to my normal race range. Not sure what was going on during the first two miles. Could have been nerves, or could have been the caffeine in the gels I took before the race. Also, around mile 3 my knee started feeling better and I was able to drop into a comfortable 7:45ish pace. 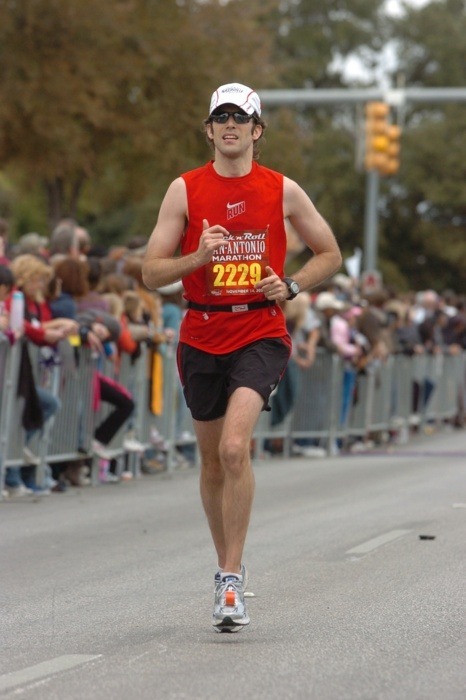 I really enjoyed running in downtown San Antonio during the first half of the course. The crowd was spread out, but enthusiastic. There were a few rolling hills in the first half, but nothing of any consequence. During mile 6, my right hip started acting up and it quickly became evident that if I ever stopped to walk, my hip would lock up. So, at that point it was all or nothing. The hip was a problem the remainder of the race, but it did not seem to significantly affect my pace or my stride. I crossed the halfway mark in just over 1:40, on pace for a 3:21 finish. However, the second half of the course was much more challenging than the first for a number of reasons. First, there was nothing to see. Supposedly this long southern route was to take the runners past several Missions. However, most of these were obscured by trees, so the course was pretty desolate. Second, there was virtually no crowd support during the second half. Finally, the second half was fairly hilly. Almost the entire 19th mile was uphill, and there was one, short, steep hill during mile 20 that was just MEAN! As we hit the hilly part of the course, my pace started to fade slightly, but I was able to keep it around 7:50 to 7:55. I started to focus on trying to set a new PR, which would require something better than 3:25:38. As I climbed that short, steep hill at mile 20, I felt a little cramp twinge in my left hamstring. These little twinges started happening more frequently as the race continued, and spread to my calf during mile 23. By mile 24, I could feel knots in both my hamstring and my calf, and had altered my stride to try and prevent a complete lock. Even with all of these physical things going on, I never hit the wall during this marathon. My legs were completely shredded, but I still had gas in the tank. This was a big deal for me considering that I bonked in my previous 3 marathons, including Twin Cities after holding 3:15 pace for 21 miles. My pace crept slightly above 8:00 for a couple of the final 6 miles, but I still had a little bit of a PR cushion as I passed the 25 mile marker. I ran the last mile as hard as my legs would allow, mostly pushing off with just my right foot. I was literally screaming at myself to keep going. By this point the full marathon course had merged back with the half, so I’m sure more than a few people thought I was completely delirious. Just after the 26 mile marker, the course had a very steep hill to the finish. 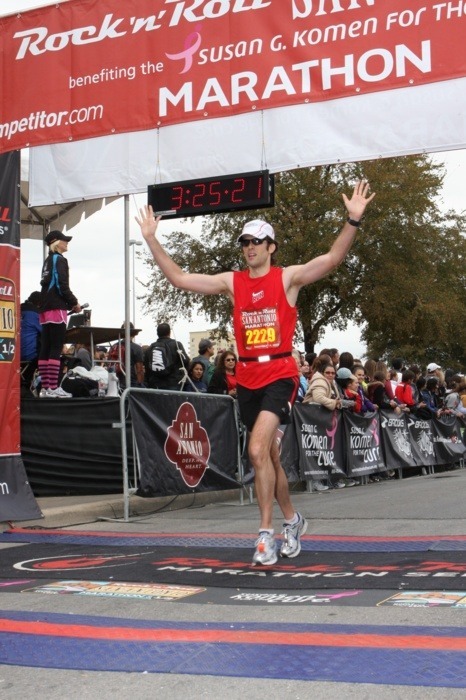 Marathoners often joke that the final .2 is the hardest part, but in this case it was true. If the hill at mile 20 was mean, then this one was vicious. The crowd was very dense at the finish, so I got a little bit of an energy boost from their cheers. I crossed the finish line in 3:24:13, over one minute faster than my PR from Twin Cities. This was 217 overall in the full out of over 4500 finishers. Considering my pre-race injuries, I am more than pleased with this result. The Race: Overall, I would give that race organizers a “B” – except for a couple of significant things, i would give this race an “A.” This race is part of the Rock n’ Roll series run by The Competitor Group, and is impeccably organized considering there are 30,000 participants in the half & the full. The first half of the course is extremely well designed and interesting, though the second half is slightly dull and could use some work (see more below). All full and half marathon participants received an Brooks technical t-shirt (very high quality). The finisher’s medal is great (like all Rock n’ Roll events). There were 20+ aid stations, and all had water and Cytomax. Like most big races, the water and Cytomax were in different cups, making it easy to distinguish. The mile markers were elevated, making them easy to see, and all included split times. As we started the race, the course crossed a set of railroad tracks about 3/4 of the way through mile one. About 2 or 3 minutes after crossing the tracks, I heard a loud train whistle and turned around to catch a glimpse of the train barreling towards downtown. Turns out that almost 1,000 runners from corrals 4 and 5 got caught by the train, and lost up to 4 minutes from their race time. While organizers are working on adjusting the times for those runners, this type of thing just can’t happen in a race of this size. The organizers have said that the train came through much later than scheduled, but whatever the reason, this significantly takes away from what otherwise is a stellar race. Another criticism is the fact that they merge the full and half marathon courses back together around mile 24. The full participants are supposed to stay to the right and the half to the left, howler the barrier is nothing more than cones. Because of this, quite a few half marathon participants were over on the full marathon lane, and most of them were walking. I have absolutely no problem with them walking in the half, but it is a problem for them to be wandering into the full marathon course. One final criticism is the finish area, which is also a problem for the Rock n’ Roll event they have in Nashville. For some reason they have the full and half marathon finish at the same place, and then try to squeeze everybody out of a very small opening back into the parking lot, and it gets really congested. However, they do have heat blankets and lots of food and drink. The volunteers are great and enthusiastic. The bag check location was clearly marked at the race start and finish. The pre-race food and refreshments are excellent, and there are LOTS of port-a-potties. The fact that the weekend includes a kid’s race and a half marathon, makes it a great event for the whole family. 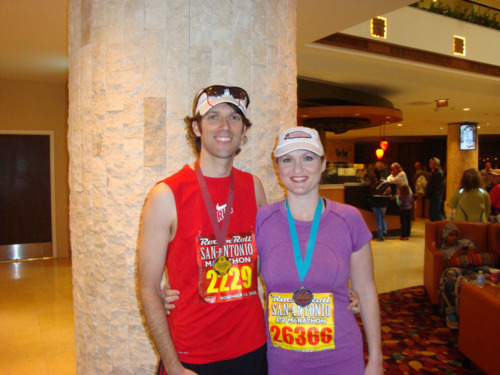 This race was special because my wife did the half marathon. I am really proud of my wife, because she set a new PR by 8 minutes!!! This was her fourth half marathon, fourth this year, and fourth consecutive to set a new PR. The Course: The course is a tale of two halves. The first half of the course has some gently rolling hills and overall is a net decline. It is also very interesting as it winds through downtown several times. 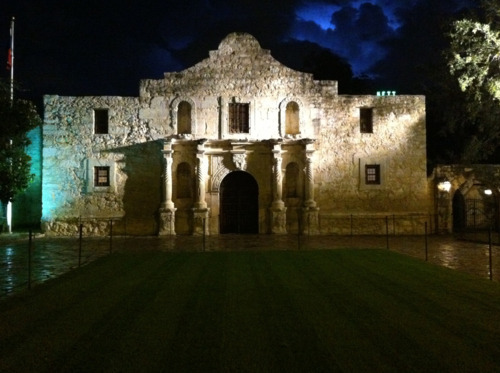 My favorite part was passing the Alamo. The crowd there was dense and LOUD. I definitely wouldn’t say that there was a lot of crowd support on the first half, but there were pockets of very enthusiastic fans. The second half is pretty dull, and includes a long out and back lollipop type loop south of town. As I mentioned earlier, this is supposed to be an opportunity to see several missions in San Antonio, but it seemed like most of them were obscured by trees. Overall, there was not a lot to see. I’ve already mentioned the hills in the second half, and overall it is a net incline. Finally, there is virtually no crowd support during the second half until you get to the finish at the Alamodome. The fans there were dense and very loud. 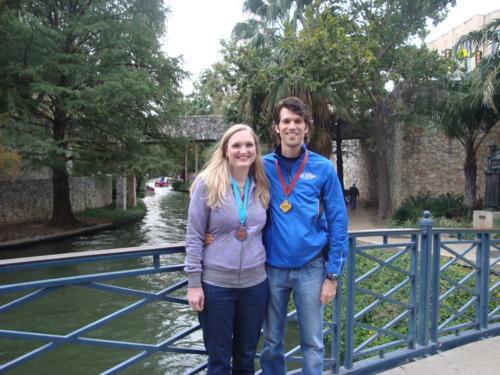 Overall, the race was a great experience, which was aided greatly by the awesome city of San Antonio, and getting a 3-day mini-vacation with my wife.